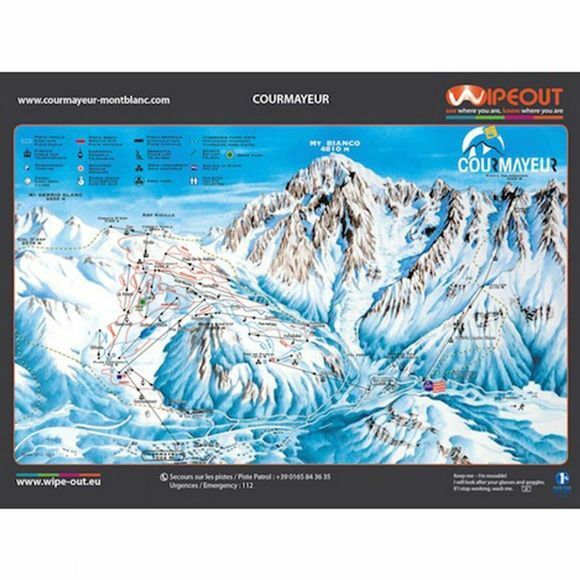 This handy Wipeout Lens Cloth covers the full Courmayeur ski area and the Helbronner lifts. Ski and gondola lines, connecting ski lifts and other facilities are marked on, to give you as much useful information, whilst still being useable. Unlikely to be blown away in the wind, the Wipeout cloth can be used with your ski gloves and does not get soggy in the snow. Spend more time having fun and less time folding the map away, as the Wipeout Lens Cloth can be scrunched up in your pocket and disappearing in seconds. The map is the official and most current resort piste map, obtained directly from the ski area.